'Tis the season to be merry with your favourite tunes! From now till 02 Jan 2017, enjoy the finer details on Sony audio products with attractive Sony Days 2016 discounts and rebates. Terms and conditions apply. Check out our Christmas Countdown 2016 #4- Online Gift Guide for the Music Lover! Hear more with high quality headphones. Pamper your ears this month and enjoy 20% off selected headphones like the award-winning MDR-EX650AP. Music has never sounded so good. *Selected models only. Subject to availability. Terms & conditions apply. 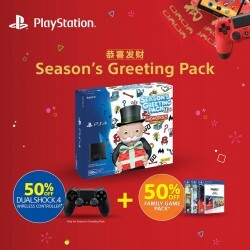 Renew and strengthen family bonds as you usher in the Year of the Monkey with the PS4 Seasons Greeting Pack! With every purchase of the Season’s Greeting Pack, dive into an action-packed gaming experience with 50% off the PS4 Family Pack and DualShock 4 Jet Black. Double your joy and savings with them from 23 Jan till 14 Feb 2016 with exclusive star buys lined up specially for the weekends. 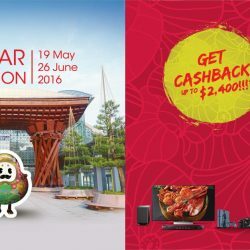 Stand a chance to win up to S$68 when you spend with them! 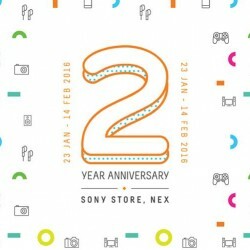 Visit Sony Store, NEX to redeem a mystery gift and find out more today! Terms and Conditions apply. 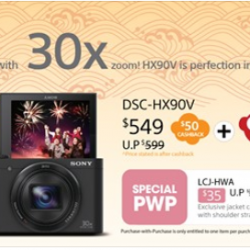 This Chinese New Year, impress your loved ones with the 18.2 megapixel Cyber-shot HX90V. Equipped with a 30x zoom range, tilting selfie screen and high-contrast retractable OLED Viewfinder, snap high-quality photos and capture every moment with perfection. 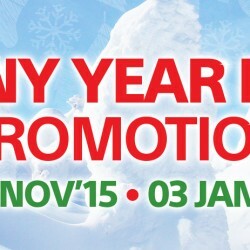 The year is coming to an end and it's time to reward yourself for your hard work in the entire year! Whether is it a new tv, camera or a game console, check out Sony's year end promotions with discounts up to 20% or up to $1500 cashback. Also dun miss this chance to grab your Christmas gifts for your loved ones! 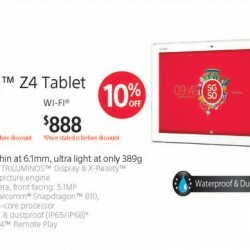 If you are in the market for a tablet, definitely check out the new Sony Xperia Z4 tablet only launched in late June. It is incredibly thin at 6.1mm and only weighs 389g which is lighter than an Ipad Air 2! The new Qualcomm® Snapdragon™ 810 processor with integrated LTE and 64-bit Octa-core CPU makes this Android tablet perform at its fastest and best. Best of all, it is waterproof so you do not need to worry about water spillage on it! Every lens tells a story, just as that every wonderful photo you take brings you unique memory for that particular travel experience. α Series Camera is mirrorless camera that suits all occasions. 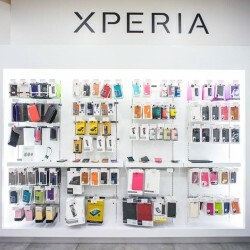 It is the future of camera and Sony is the international top leader. This series can be categorized under three types: Casual Shooting, Advanced Amateur and Professional Capability. 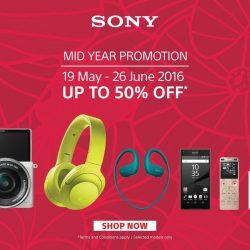 You can shop according to your preference and needs with this round of Sony sales! 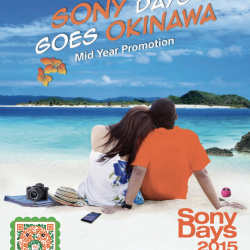 Enjoy with your love one's this sony days at Okinawa mid year promotion 2015, ends till 28 of june 2015 so what are you waiting for? hurry grab now! 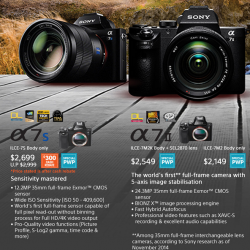 Been looking to get yourself the full-frame, palm-sized α7 series camera? This is the time to take action! Make your purchase anytime from 8 to 28 May. 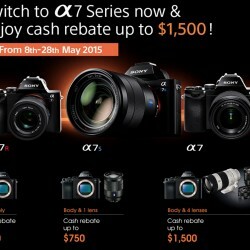 Switch to a7 now and enjoy cash rebates of up to S$1500! 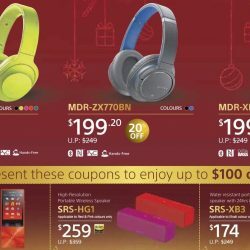 Salebrate the year end colorful deals at Sony Day 2015. 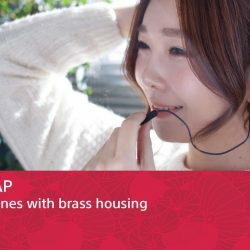 Enjoy up to 20% OFF on Xperia, Play Station, Bravia & Home Audio Video, High Resolution Audio, Interchangeable Lens Camera, Cyber-shot, Handy-Cam, Recording Media & Energy, and personal audio! One day only at all Sony Stores. 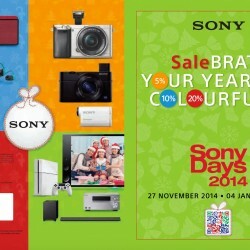 Sony Days offers up to 20% discounts and free gifts on selected electronics until 4th Jan 2015. 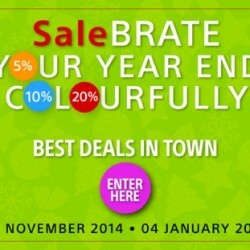 SaleBRATE your year end colourfully with the best deals in town at Sony. Enjoy! 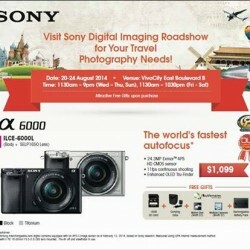 Visit Sony Digital Imaging Roadshow for your Travel Photography Needs! Attractive Free Gifts upon purchase.